Dear Readers, Bank Exam Race for the Year 2018 is already started, To enrich your preparation here we have providing new series of Practice Questions on Quantitative Aptitude – Section. Candidates those who are preparing for Canara Bank PO Mains 2018 Exams can practice these questions daily and make your preparation effective. Directions (Q. 6 – 10) Study the following information carefully and answer the given questions: The following bar graph shows the investment of 6 different persons. 6. P and S started a business. After 4 months, P invested Rs. 10000 more and at the same time A entered into a partnership with the investment of double the amount of Q’s initial investment. Find the share of A, if the total profit at the end of a year is Rs. 103500? 7. S and B started a business by investing in the ratio of 3: 2. M joined with them after 3 months. M’s initial investment is 25 % more than the initial investment of T. Find the total profit at the end of a year, if the share of B is Rs. 36000? 8. Q, S and U started a business. After 5 months, C and D joined them with the investment in the ratio of 2: 3. And after another 3 months, S withdraws Rs. 5000 but U invested Rs. 10000 more. If the ratio of share of U and D is 104: 63, then find the initial investment of C? 9. The total investment of P and R is approximately what percentage of total investment of Q and S? 10. R, U and N started a business. N’s investment is 30 % more than the initial investment of U’s investment. Find the share of U, if the total profit at the end of 2 years is Rs. 142000? 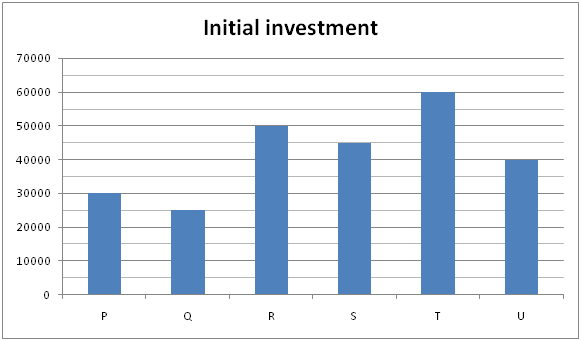 The following bar graph shows the investment of 6 different persons. 6) P and S started a business. After 4 months, P invested Rs. 10000 more and at the same time A entered into a partnership with the investment of double the amount of Q’s initial investment. Find the share of A, if the total profit at the end of a year is Rs. 103500? 7) S and B started a business by investing in the ratio of 3: 2. M joined with them after 3 months. M’s initial investment is 25 % more than the initial investment of T. Find the total profit at the end of a year, if the share of B is Rs. 36000? 8) Q, S and U started a business. After 5 months, C and D joined them with the investment in the ratio of 2: 3. And after another 3 months, S withdraws Rs. 5000 but U invested Rs. 10000 more. If the ratio of share of U and D is 104: 63, then find the initial investment of C? 9) The total investment of P and R is approximately what percentage of total investment of Q and S? 10) R, U and N started a business. N’s investment is 30 % more than the initial investment of U’s investment. Find the share of U, if the total profit at the end of 2 years is Rs. 142000?